One-health approaches have started being applied to health systems in some countries in controlling infectious diseases in order to reduce the burden of disease in humans, livestock and wild animals collaboratively. However, one wonders whether the problem of lingering and emerging zoonoses is more affected by health policies, low application of one-health approaches, or other factors. As part of efforts to answer this question, the Southern African Centre for Infectious Disease Surveillance (SACIDS) smart partnership of human health, animal health and socio-economic experts published, in April 2011, a conceptual framework to support One Health research for policy on emerging zoonoses. The main objective of this paper was to identify which factors really affect the burden of disease and how the burden could affect socio-economic well-being. Amongst other issues, the review of literature shows that the occurrence of infectious diseases in humans and animals is driven by many factors, the most important ones being the causative agents (viruses, bacteria, parasites, etc.) and the mediator conditions (social, cultural, economic or climatic) which facilitate the infection to occur and hold. Literature also shows that in many countries there is little collaboration between medical and veterinary services despite the shared underlying science and the increasing infectious disease threat. In view of these findings, a research to inform health policy must walk on two legs: a natural sciences leg and a social sciences one. Infectious diseases which occur in an epidemic or explosive form attract national, regional or international attention because of their propensity for causing high morbidity and rapid transboundary spread across national borders or even across continents and because of their potential for causing high mortality in affected populations and national and/or international socio-economic impacts. Those that occur in endemic form or cause chronic disease tend to attract less public attention, although locally they might even be of a higher socio-economic impact (Maudlin, Eisler & Welburn 2009). This latter category includes many of what have been referred to as 'neglected' or 'lingering' zoonoses. In general most of the newly recognised emerging or re-emerging infectious diseases of humans or animals have tended to be of the epidemic or transboundary type (World Bank 2010). An emerging disease may be defined as one 'that is newly recognized or newly evolved, or that has occurred previously but shows an increase in incidence or expansion in a geographical, host or vector range' (FAO/OIE/WHO 2004). The majority (i.e. about 60%) of all infectious diseases of humans and most (i.e. about 75%) emerging infectious diseases of humans have been shown to have an animal origin, and thereby of zoonotic nature (Jones et al. 2008; Taylor, Latham & Woolhouse 2001; Otte et al. 2007; Woolhouse & Gowtage-Sequeria 2005, cited by Shaw 2009). Examples of such emerging diseases include Ebola, avian influenza, pandemic influenza, human immunodeficiency virus (HIV) and AIDS, bovine spongiform encephalitis (BSE) and the Nipah virus. Examples of the so-called neglected or lingering zoonoses include anthrax, bovine tuberculosis (TB), brucellosis, cysticercosis and neurocysticercosis, cystic echinococcosis or hydatid disease, rabies, zoonotic sleeping sickness or human african trypanosomosis (HAT), and food-borne zoonoses, including Salmonella (salmonellosis), Campylobacter (campylobacteriosis), and Escherichia coli (colibacillosis) infections of animal origin affecting millions of people annually. In order to address the infectious disease burden effectively - especially in developing countries -there is, therefore, an increasing body of opinion that advocates not only an enhanced collaboration between the human and veterinary medical sectors (i.e. the so-called one medicine, Schwabe 1969) but also inter-sectoral collaboration across the public, animal and environmental health sectors, involving both the natural and social sciences (Coker et al. 2011; Zinsstag et al. 2011). In this regard current health policies, whether for human or animal health, need some re-examination as to their fitness-for-purpose for the One Health approaches. As part of an effort to generate evidence to inform policy development for re-examining how existing health systems are structured, resourced, and managed to create synergies between animal and human health, and in the process to reduce the effect of zoonotic disease burdens, the SACIDS smart partnership of human health, animal health and socio-economic experts published, in April 2011, a conceptual framework to support one-health research for policy on emerging zoonoses (Coker et al. 2011). The present paper builds on this framework to examine factors that have been reported to affect the burden of disease and how such a burden affects socio-economic well-being so that research projects, especially in sub-Saharan Africa, could be geared towards analysing some of the linkages documented in literature. 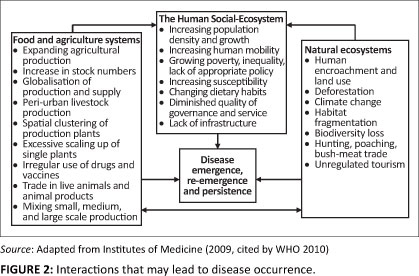 The specific objectives were to, (1) analyse how interactions amongst wildlife, livestock, and humans lead to occurrence of infectious diseases, (2) explore the application of One Health approaches to controlling infectious diseases, (3) investigate how One Health approaches, theoretical factors, health policies, and socio-economic factors explain burden of disease and (4) illustrate the impact of burden of disease on poverty. The findings were intended to generate empirical information on which advocacy might be based for more collaboration, and how to realise it, for more effective control of lingering and emerging infectious diseases. reduced incidences of disease and improved survival following infection. Success in those interventions is expected to contribute to attainment of the highest level of success, which is having healthy animal and human populations, economic security, and social stability. However, that highest level of success can hardly be attained without active participation of other stakeholders. That is why in the SACIDS framework such stakeholders have been identified, as seen under the titles 'Context' and 'Mechanism'. The stakeholders are other natural scientists (besides veterinary and medical personnel), ecologists and agricultural scientists to address environmental and agricultural issues; socio-economists to address societal issues including human behaviour and economic issues and policy-makers to address health service organisation issues, patterns and provision and access, fiscal systems, regulation and governance, information and planning aspects. Infectious diseases can spread directly or indirectly from one person to another, one animal to another, or from animals to persons and vice versa. Wild animals are known to be reservoirs of pathogens some of which may not affect them due to their genetic make-up and adaptation to wild conditions, albeit some of the pathogens can cause disease in livestock and in humans. But infectious diseases can also cross from either humans to wild animals (e.g. human TB) or from livestock to wildlife (e.g. bovine TB). A major transboundary animal disease of cattle that used to cause heavy mortality in wild ungulates, whose elimination from the Maasai eco-system of Tanzania and Kenya resulted in a progressive increase in the population of wildlife, notably the wildebeest in the Serengeti (Kock 2003) and whose global eradication depended on concerted action only in the cattle population, was rinderpest (FAO & OIE 2011). Interactions amongst wildlife, livestock and humans can favour the spread of the pathogens either directly to people through contact with wild animals harbouring the pathogens, contact with contaminated wild products, or consuming wildlife products, including bush-meat. These interactions are best explained with the aid of a diagram like the one in Figure 2 by Institutes of Medicine (2009, in WHO 2010). A major inference from Figure 2 is that interactions amongst the members of the natural ecosystems (e.g. human encroachment and land use, etc), food and agriculture systems (e.g. expanding agricultural production, etc. ), and human living environments (including increasing population density and growth, etc.) can lead to disease occurrence or infection spread. In their analysis of interaction trends amongst wildlife, livestock and humans, Jones et al. (2008) concluded that the majority of emerging infectious diseases of humans (71.8%) originate from wildlife. the parasite-stress theory of human sociality. interactions within recipient host species (MacArthur & Wilson 1967). The latter states that humans' ontogenetic experiences with infectious diseases as well as their evolutionary historical interactions with these diseases exert causal influences on human psychology and social behaviour (Thornhill 2010). This theory emphasises the causal role of non-zoonotic parasites, which are characteristic of disease transmission from one person to another one, rather than zoonotic parasites which transmit diseases from vertebrate animals to humans. Burden of disease is a measure of financial cost, mortality, morbidity, or other indicators for humans and animals at the individual, community, herd or flock, farm, national, or global level due to diseases. It is normally measured in terms of Disability-Adjusted Life Years (DALYs). A DALY is equivalent to the loss of one year of 'healthy life' and allows the burden of disease in a population to be measured as the gap between current health and an ideal situation where everyone lives to old age, free of disease and disability (Mathers et al. 2001). This definition is from a medical point of view; it is in human medicine that burden of disease started being measured, and the measurement is described below. Burden of disease in humans is measured in various ways using various indicators, which are presented in Table 1. Although WHO publishes annual tables showing how many DALYs a year different diseases are estimated to cost, the zoonotic component of infectious diseases is largely missing from the league of tables (Coleman 2002, in Shaw 2009). In some works, total burden of disease is calculated; where this is done, conventionally, direct burden of disease in people is measured in DALYs, and all the other components (direct losses in animals and costs of prevention and treatment in people and animals) are measured in monetary terms (Brazier et al. 2007; Drummond et al. 2005; Shaw 2009). Unlike in humans where assigning monetary values to people's losses of life complicates calculation of burden of disease, in animals the calculation is straightforward because most direct losses due to illness and due to death have objective monetary values (Shaw 2009). However, the calculation is complicated by the presence of many animal species which have various roles in the human society. In spite of the differences and complexities in calculating burdens of disease in humans and animals, Table 2 gives the ways of how to do the calculations. Collaborative efforts of many disciplines and experts in those disciplines to deal with infections diseases to reduce the burden of diseases in humans and animals is one thing; there are other factors which can enhance or constrain the pace towards controlling the diseases. In this paper, the other factors considered are health policies, the practice of health care services on the ground, theoretical factors, and socioeconomic factors, which are discussed below. Health policy means different things to different people, but its compressive definition which is widely acceptable is given by Walt (1994) as a set of statements stipulating courses of action that affect the set of institutions, organisations, services, and funding arrangements of the health care system and goes beyond health services by including actions or intended actions by public, private and voluntary organisations that have an impact on health. She adds that health policy is concerned with environmental and socio-economic effects on health as well as with health care provision. However, many books on health policy focus narrowly on the health care system only. Therefore, some scholars, for example Nancy (1987, in Walt 1994), prefer talking about health public policy in order to differentiate the broader definition from the narrow one. Health policies are affected by related international polices and by other policies which have nothing to do with health care or services for example, (1) environmental pollution, (2) insecurity and instability (whether caused by employment or violence), (3) economic regulation and deregulation and (4) contaminated water and poor sanitation, all of which increase morbidity and mortality. In view of this, the implementation of health policies may be constrained or enhanced by these other policies. Besides these, also cost-sharing affects health policies. For example, in Africa, it is widely known that the policy of cost sharing in both animal health and human health since the 1980s has complicated access to the services. This situation is well explained by Rushton and Leonard (2009) as follows: before the 1980s, particularly from the late 1940s, animal health had been regarded as a predominantly public service and thus was predominantly provided by governments. But since the 1980s the provision of the services has been increasingly opened to market institutions. However, animal health, like human health, is subject to market failures, and there remains a role for the state in their correction, through the provision of selected goods and services, the setting and monitoring of regulations and taxes and subsidies. In the human health sector cost-sharing has been characterised by people contributing for health services but ending up not getting the services, for example prescription for medicines to buy instead of being given the medicines. This connotes high burden of disease, especially in rural areas where people cannot afford paying for health services in private health facilities, which have proliferated concomitantly with the rise in cost-sharing in public health facilities. With respect to the practice of health care services, delivery of health services is indicated by a number of variables, which should be applicable to individuals, households, communities, populations, nations, regions, and globally so that comparisons in the levels of the services can be possible. For human diseases, WHO (2010) gives a number of indicators, which are divided in the following categories: (1) health service coverage, (2) risk factors, (3) health workforce, infrastructure and essential medicines, (4) health expenditure ratios and per capita health expenditures and (5) health inequities. Under each of those categories there are a number of indicators. The indicators are not reproduced here for saving space, but they are readily available on the Interment. Better health services result into less burden of disease, and vice versa. About health service practice for animals, as in human health, health indicators are very important in order to prevent, control and treat animal diseases effectively. According to European Commission (2007), simple and reliable performance indicators help to measure progress towards animal health, guide policy, inform priorities, and target resources. The indicators can be divided into hard indicators of animal health (e.g. disease prevalence, number of animals eliminated) and softer indicators tracking the confidence, expectations and perceptions of citizens. In rural areas of developing countries, like for human health, animal health statuses and services are poor vis-á-vis urban areas, mainly due to fewer animal health facilities and fewer animal health personnel. As a result, according to WHO (2006), zoonoses typically affect isolated rural livestock keeping communities and those living in urban slums. Psycho-social theories of health care seeking behaviour are amongst various factors that explain burden of disease. The theories explain the determinants of behaviour that lead people to accessing and utilising health services. Some of the determinants are common in seeking health care services for humans and for animals, and these include local people's experiences with diseases, availability of traditional versus modern treatment, knowledge and beliefs about diseases, decision process for seeking health services, and parochial versus cosmopolitan outlook of diseases. The behavioural aspects that are practised in turn determine the extent to which health services are accessed. Some of the prominent theories are Parsons' sick role, Mechanic's general theory of help seeking, Suchman's stages of illness and medical care, Theory of Reasoned Action (TRA), and Theory of Planned Behaviour (TPB). Besides the theories, there are models for health care seeking behaviour. 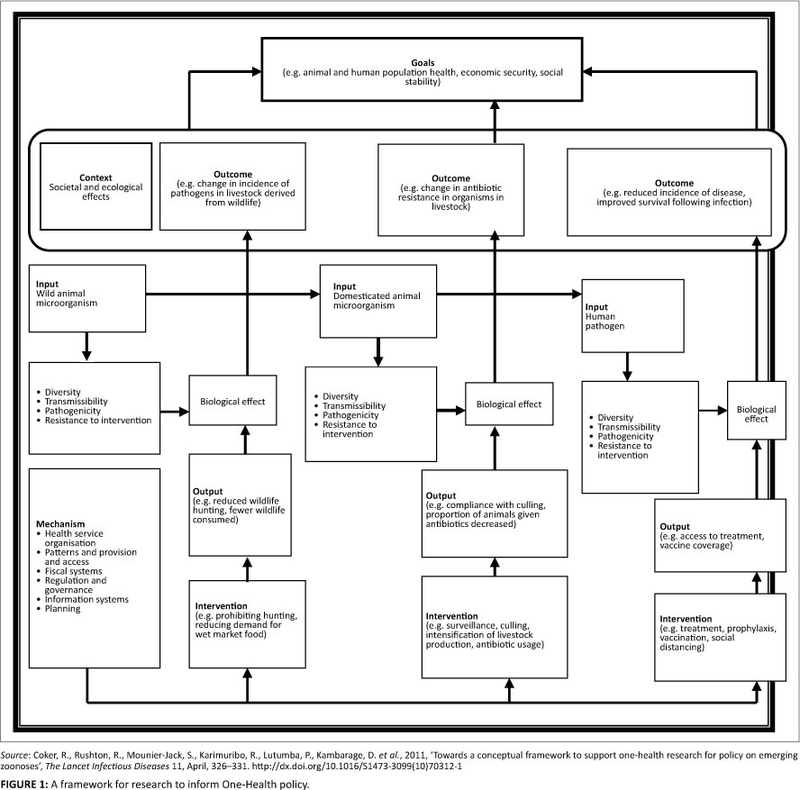 The difference between the theories and the models is that the former consider decision points or stages of health care seeking, but the latter can be regarded as containing sets of interacting variables (Rebhan 2009). One of the prominent models is the Health Belief Model (HBM). In view of this model, if individuals do not perceive the illness as serious, they will not seek treatment or preventive measures for themselves, for their household members or for their livestock (Rosenstock, Strecher & Becker 1994; Sheeran & Abraham 1995, in Hausmamm-Muela, Ribera & Nyamongo 2003). In the interest of saving space, only some of the theories and models are described here. The TRA and the TPB are closely associated as the latter is an extension of the former. By TRA, Fishbein and Ajzen (1975) argue that attitude and subjective norm are the primary determinants of behaviour. However, no behaviour is specified in both of the theories. Therefore, various researchers in medical and agricultural systems (including livestock production) have applied the two theories in various situations and found them applicable to explaining correlations between certain factors (drivers of behaviour) and behaviour (good or bad) that people express. For example, both TRA and TPB have been used to study farmers' conservative behaviours, and TRA has been used to study attitude towards buying feeds for livestock, and adoption of olive oil in British kitchens (Jackson et al. 2006). If the behaviour is assumed to be the way how people act in choosing sources of health care services that people prefer for themselves, for their household members, or for their livestock, the two theories can be used in the same way as the Health Care Utilisation Model (HCUM), which was developed by Andersen (1968) looking at three categories of determinants of choosing where to seek health services, (1) predisposing characteristics (demographics, position within the social structure, and beliefs of health services benefits), (2) enabling characteristics (resources found within the family and the community) and (3) need-based characteristics, including the perception of need for health services, whether individual, social, or clinically evaluated perceptions of need (Wolinsky 1988, in Rebhan 2009). The model has undergone modifications a number of times, but its current form centres specifically on treatment selection - whether people go for traditional healers, modern healers, drug sellers, self-treatment, or no treatment. measuring and understanding the problem of health inequity and assessing its impact of action. Poverty is pronounced deprivation in well-being (World Bank 2001). It is a multidimensional phenomenon whose comprehensive definition would have to include all of its indicators, which are innumerable. Accordingly, no attempt is made to present its definition here, but it is well known that its indicators include deficiencies in basic needs, especially food, shelter, and clothes; and in social services like education, healthcare, and water supply. It is also indicated by vulnerability, exposure to risk, voicelessness, powerlessness, and capabilities that a person has (Sen 1999; World Bank 2001). There are various ways of measuring poverty, but they are avoided in this short paper. However, at least it is worth mentioning that income is a poor indicator of well being since it is volatile and some people having much income may not use it to obtain important needs. This view is supported by Sen (1999) who argues that resources are imperfect indicators of well-being and Alkire, Qizilbash and Comim (2010) who contend that income is a fuzzy measure of poverty. Therefore, non-monetary indicators are preferable to monetary ones, either to supplement the latter or alone. The preference for using non-monetary indicators grew in the 1990s after Sen (1999) came up with the capability approach to poverty measurement, which is linked with the human development perspective and is now fashionable in measuring poverty. Empirical information shows that healthier people are more productive and that wealthier people can obtain things that make them healthier. For example, studies which were conducted in Colombia, Peru, and Nicaragua in the mid-1990s showed that reduced exposure to disease is associated positively with the health of adults and also with greater individual income-generating capacity (Savedoff & Schultz 2000). With respect to animal health, the burden of disease affects not only livestock keepers but also consumers of livestock products like meat, milk, and eggs. For livestock keepers, there may be losses of income. It is known that about 42% of the poor worldwide are dependent on livestock as their livelihoods but that imperfect or missing markets often trap them in low income equilibriums, preventing them from benefiting from the increased demand for animal protein (Otte & Pica-Ciamarra 2009). Besides the problem of market imperfections, diseases affect much the ability of livestock keepers through low productivity and mortality of their livestock. Accordingly, it is obvious that amongst livestock keepers infectious diseases contribute to impoverishing them. In view of this, the same authors (Otte & Pica-Ciamarra 2009) contend that if poverty alleviation is a policy goal, policy makers should identify, design and implement public actions that allow poor livestock producers to take advantage of the increasing demand for meat, milk and eggs. We have seen in the literature reviewed that the occurrence of infectious diseases is driven by causative agents (viruses, bacteria, parasites, etc) and mediator conditions (social, cultural, economic or climatic) which facilitate the infection to occur and aid spread or transmission of the infection. The causative agents are best understood through the natural sciences whilst the mediator conditions are best understood through the social sciences. Accordingly, the research framework that recognises the contribution that socio-economists can play in collaboration with biological scientists to harness innovation in science and technology in order to improve the capacity to detect, identify and monitor infectious diseases of humans and animals and their interactions in order to better manage the risk posed by them is one that is likely to provide the type of evidence-based policy impact. The practice of One Health approaches is long overdue. Adopting them should not be debatable, but the modalities of how to adopt and practise them should be the discussion, in view of the factors that enhance and those that constrain them. Accordingly, factors that constrain the adoption and practice of One Health should be curbed and those that promote it should be fostered. Using social research methods (e.g. questionnaire-based interviews, key informant interviews, life histories, PRA, FGD, ethnography, grounded theory, probing, and prompting), and tools (e.g. questionnaires, checklists of items for discussion, Likert-type scales, index scales, and differential semantic scales) can add value to explanation of disease emergence, re-emergence, and persistence as well as burden of disease; the tools are good at studying attitudinal and behavioural aspects, which cannot be studied biologically. Moreover, economics of controlling diseases facilitate quantification of burden of disease, for example by determining burden of disease in monetary terms and using the separable costs method of cost-effective analysis to determine equitable sharing of costs amongst various sectors working collaboratively to control diseases. The One Health driven policy research framework to examine the extent to which One Health approach can help to streamline health policies in the public, animal, and wildlife health sectors in such a way that they facilitate more collaboration between natural and social scientists so as to increase the effectiveness of interventions to stem infectious diseases for better socio-economic well-being is more focused on health policies. However, there may be other factors apart from health policies constraining the collaboration, which may include health service provision on the ground, psycho-social theories of health care seeking behaviour, and socioeconomic factors. Accordingly, such a framework should include an assessment of such factors as determinants of collaboration amongst various stakeholders, to find which of them are more associated with enhancing or deterring the collaboration and reduction of the burden of disease. Infectious diseases increase the burden of disease in humans and animals, and the burden in turn aggravates poverty, especially amongst rural and sub-urban people whose economy mainly depends on livestock. Therefore, there should be equitable control of human and animal diseases in rural and urban areas. Literature shows that the majority of infections, new or old, either do or have the propensity to move across species (human and animals) or may have originated from animals before assuming the human-to-human transmissibility. One Health approaches seem to be the logical strategy. But one should not under-estimate the challenges by the current organisational systems; even for the shared problem of zoonoses between animal and human health; FAO (2006) has observed the challenges. School of Hygiene and Tropical Medicine (http://www.lshtm.ac.uk), the Royal Veterinary College (http://www.rvc.ac.uk) and the London International Development Centre (http://www.lidc.org.uk).